Easy flowers like marigolds and zinnias will never lose their luster in the flower garden, but sometimes it’s fun to shake things up with a new introduction. Even if you are new to flower gardening, you can achieve blooming success with these eight low care, underused plants. Also known as mountain garland and farewell-to-spring, these native annual flowers look delicate but tolerate a wide range of growing conditions. True to the garland name, the flower spikes are easy to fashion into crowns. The plants grow from Arizona to Alaska in a range of colors including white, purple, pink, orange, and red. Plant the seeds early, as they will germinate readily in cool temperatures. Flowers will close in the evening and open in the morning, a clue to the fact that they belong to the evening primrose family. 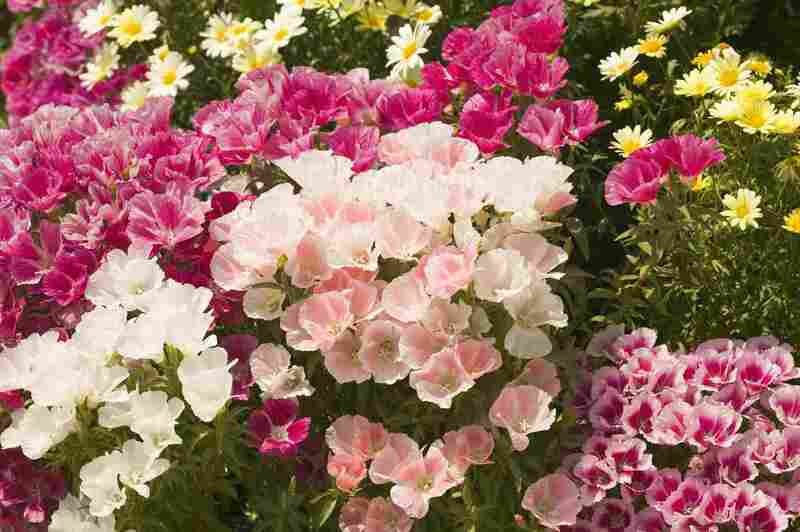 Give clarkia average soil in sun or partial shade and water only during droughts to keep these plants in bloom. Some consider the ‘Baby Blue Eyes’ variety of nemophila the most showy with its masses of blue early summer blossoms with white centers, but don’t overlook the ‘Total Eclipse’ variety with trendy black flowers. ‘Five Spot’ is another cute and quirky nemophila favorite, featuring white flowers with a purple splotch on each petal. All three varieties make excellent ground covers in areas with moist soil. A partial sun exposure will protect the delicate flowers and extend blooming time to at least three weeks. If you aren’t sure how to pronounce this tongue twister of a name, just ask for this flower by its common moniker, the lamb’s tail. The pink, feathery flowers may remind you of celosia, which makes sense, as both are members of the Amaranthaceae family. Lamb’s tail is a tender perennial in zones 9-11, but most gardeners grow it from seed each year as an annual. The silvery foliage is a clue to the drought tolerance of this xeriscape favorite, so don’t overwater your plants. Like other plants that grow in desert areas, lamb’s tail needs full sun and lean, loose soil without added fertilizer. Every flower garden can benefit from the vertical interest of a vine, and the purple bell vine is one you’ll want to grow again and again. Unlike some annual vines, which outgrow any reasonable garden trellis before the end of summer, purple bell vine has a moderate growth habit, and can be pruned to maintain a tidy shape. The plants can take more than a month to germinate from seed, so it’s beneficial to start with transplants, especially if you live in a cold climate. Site your purple bell vine in a partly sunny spot (afternoon shade is perfect), and keep it moist throughout its growth. If you cut a few of these for the vase you’ll soon see why one common name of this 12-inch plant is “catchfly,” as the sap is very sticky. The true blue variety of this five-petaled annual can’t be beat, but the pink, white, red, and lavender types are lovely as well. Viscaria is a hardy annual that won’t fade when temperatures rise. Plant in full sun, and water when the soil surface dries out. Although Achyrachaena mollis isn't a common flower at the garden center, you might see them growing in a California meadow where they flourish as native plants. The common name comes from the way these summer blooms shatter like dandelions when you give them a puff. These annuals tolerate clay and drought well, and will reseed themselves after their end-of-summer blooming cycle is finished. The Alonsoa meridionalis is a Chilean native that will delight your senses with a myriad of tiny blooms held aloft on three-foot stalks all summer. When blooming slows down, cut the stalks back and wait for a second flush of flowers when cooler temperatures arrive. Mask flower plants appreciate full sun and rich soil, making them a suitable companion for roses or dahlias. In addition to the cheerful red variety, you can grow the creamy salmon 'Apricot' cultivar. Are you looking for a fast growing plant to perk up your arbor or fence? Podranea brycei grows as a shrub or a vine, depending on how you prune it. Either way, the bright pink trumpet-shaped flowers will add fragrance to your sunny garden throughout the season. Also known as the bubblegum vine or Port John's creeper, it is a tender perennial, and looks its best in zones 9 and warmer.